If there was a dedicated award for achievements in quirk, hedging bets on Rent-a-Cat would surely be a safe wager. The very core is drenched in wackiness, and it permeates every frame. Mikako Ichikawa plays Sayoko, a thirty-something year-old who has earned a reputation as being a bit of a crazy cat lady. And seemingly with good cause - she's lives alone with dozens of the things, and spends her days walking the banks of the local river yelling "RENNNNNT A.... NEKO. NEKO NEKO!" She rents her cats to those in need, albeit only those who pass her personal inspection - those she deems sufficiently lonely and living in a feline friendly environment. Oh, and she also moonlights as a fortune teller. Or is that a stock broker? Rent-a-Cat's most effective trick is its structure, which almost rhythmically trades in repetition and remixes. All the film's distinct chapters echo with each other strongly, with the exception of some significant variations in the final stretch. But the film's three main 'episodes' have Sayoko discover a potential customer, rent the cat, and return a few days later to pick it up. Each story hits near identical beats, but director Ogigami works some minor magic with this unusual method. Jokes are delivered with different punchlines, and the trio of characters Sayoko rents her cats to - a lonely elderly woman, a working man separated from his family, and a bored rent-a-car employee - achieve varying levels of enlightenment through their time with the cats and brief encounters with their owner. Each section is punctuated with a witty, bizarre exchange between Sayoko and her nextdoor neighbour - a man (Katsuya Kobayashi) cross-dressing as an old lady who dispenses insults and endlessly unhelpful advice. Structurally, Rent-a-Cat is almost musical - verse, chorus, verse, chorus, verse, chorus, bridge, chorus. The comedy has made the cultural transition comfortably, much like the work of similarly quirky Japanese auteur Satoshi Miki. The situations are so endearingly odd that you'll easily adapt to the film's comedic rhythm. It even manages that rarest of things - the genuinely chuckle-worthy dream sequence (it's also a testament to the film's overall strangeness that the sequence, imagining a rival rent-a-cat office, could probably credibly exist in the film's distinctive world even without the wake-up reveal). Ichikawa is a strong lead, expertly navigating the ludicrousness with a straight-face and unwavering commitment. 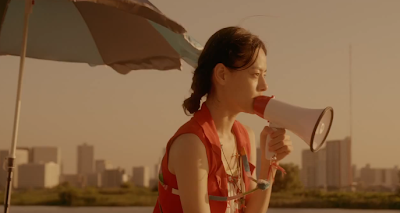 Pleasant directorial and technical touches - such as Sayoko's homemade rental forms and perpetually summery cinematography - reinforce the film's sense of irresistible giddiness. Yet there's also a layer of bittersweetness to the film. The characters all experience varying degrees of isolation, and a rented cat can only partially fill the void of an unfulfilled life. In the last chapter, the film focuses on Sayoko herself, in which she's visited by a potentially spectral school friend. While it's abundantly clear that our protagonist is lacking in meaningful human interaction, she's still painted as a proud, brave individual. Our hero has problems, destined to exist on the fringes of society. But she can function despite the strange looks and taunts of onlookers, and finds her own satisfaction through her cat-renting altruism (well, altruism with a 1,000 yen fee). Rent-a-Cat earns laughs alongside a curious emotional undercurrent, and is a thoroughly entertaining time. Embrace the quirk and you'll find much pleasure in this oddball universe which, I should confirm, also features plenty of shots of cats doing adorably silly things.